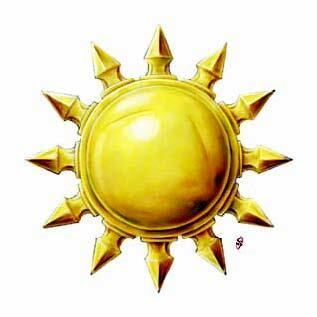 The Blessed Brotherhood of the Glorious Sun (often just the Blessed Brotherhood) was a chartered Cormyrian adventuring company affiliated with the Church of Amaunator. They were based in the House of the Morning in Eveningstar. They championed the cause of the Morninglord, and upheld law and goodness wherever these were challenged. They were killed in 1385 DR by goblins of the Red Hand Tribe in vengeance for an attack actually perpetrated by a rival adventuring company, the Ebon League. The Blessed Brotherhood has completed a number of quests, making them popular among the people of Eveningstar. A few years ago, they stopped an Arabellan horse thieving ring and chop shop1. At the church's behest, they put an end to Lucian Sewell's smuggling of cassil and nararoot from Marsember. Since then, birthrates have soared, especially among teenagers who are ill-prepared for the consequences of their actions. On several occasions they have guarded caravans of Amaunatori missionaries as they passed through the Storm Horns to witness to the goliath barbarians who live there. It was the Blessed Brotherhood who brought recipe for the chocolate éclair, Reardon Cormaeril's favorite pastry, back to Eveningstar from the Royal Bakeries in Suzail. Reardon had intended to keep the recipe to himself, but the Blessed Brotherhood intentionally leaked it. Though the common people rarely eat true éclairs, the Eveningstar Bakery's "éclair-style donut products" (filled with vanilla pudding instead of crème pâtissière) are still pretty good. 1. Horses were being chopped, marinated in German sweet und sauer sauce, and served in a shop… mit spätzle.